ToughBuilt are now a leading brand of power tool accessories, PPE and storage. Designed to improve the experience of the user through their clever designs. They've manufacturered a core range of innovative products to help professionals build faster, build stronger and work smarter. Behind every new invention is a stringent manufacturing process. Engineered, tested and verified in the USA to strict quality standards. They have 100% confidence in their portfolio. Each item is backed by a limited Lifetime Warranty. To qualify, register your order online with ToughBuilt within the first 30 days of purchase. 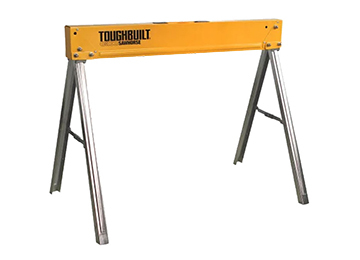 Inside the range you'll discover durable, rugged and sturdy sawhorses constructed from high grade steel. Their unique features could easily transform productivity on the jobsite. Look out for telescopic legs, adjustable support arms, fast-open mechanisms, powder-coating and zinc-plating to prevent errosion for working in any terrain. Not only are they fit for purpose on the job, they effortlessy fold and are easy to transport. Their open tote bags have been built with careful consideration to divide up your tools into useful compartments so you can stay organised throughout the working day. With ample pockets that store and protect your hand tools with removeable parts to customise each tote to your needs. The ToughBuilt catalogue is growing but only at a rate they are comfortable with. They only want to produce the best and ensure the user gets the best results. They are industry lead. You speak and they'll listen. At the heart of every design is you, the customer. PPE is another important area of this collection with a solid range of Knee Pads. Designed to alleviate pressure, provide ultimate stability and offer all day comfort. Depending on your task, your working environment and your needs, each knee pad has been built to meet a specific criteria. There are waterproof pads, gel pads, foam-fit pads, ultra light pads and even pads that mould to the shape of your knee. Their patented designs are highly regarded and will improve your working conditions for a more enjoyable experience. Choose ToughBuilt if you want your work life to be even better.